Watching this at 10pm the other night was a bit of a mistake. I felt vaguely traumatised after it. There are certainly much more horrific or dark or violent films out there than Pan’s Labyrinth but that still does not mean it is a good idea to watch this late at night, alone and unprepared if you’re anything like me. 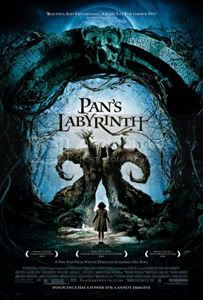 Pan’s Labyrinth (original Spanish title: El Labirinto del Fauno, “The Labyrinth of the Faun”) follows a young girl called Ofelia (Ivana Baquero) as she accompanies her very pregnant mother (Ariadna Gil) to join her stepfather in the countryside of post-civil war Spain. Her stepfather, Captain Vidal (Sergi López i Ayats), is a cruel fascist military officer who is determined to root out all the rebel Maquis in the countryside. Beside the captain’s chosen base – an old mill – there is what remains of an ancient labyrinth. Ofelia encounters a strange flying insect that transforms into a little fairy of sorts and she follows it into the labyrinth, where it takes her down a spiral staircase to meet a faun. The faun (Doug Jones) tells Ofelia that she is the Princess Moana of the underworld, long dead and now reborn – just as her father knew she would be. But before she can return home, she must complete three tasks before the next full moon. The tasks include retrieving a golden key from the belly of a giant toad and entering the lair of a frightening creature that has eyes on the palms of its hands and thinks little children make for a lovely dinner. The movie cross-cuts deftly between Ofelia’s fantastical tasks and the grim, harsh reality in which her mother dies in childbirth and Vidal tortures and kills in his attempts to hunt down the rebels. The juxtaposition of the two worlds – separate, yet the same for Ofelia – emphasises Ofelia’s sense of isolation and the danger that surrounds her in both the “fantasy” and in the “real”. Poor girl hardly ever seems to get a break throughout the film. Clever camera tracking and editing work at a few points are used to good effect to add flair and an almost poetic quality to what could have been otherwise very typical sequences. For instance, the cross-cutting between Ofelia’s tasks and Vidal’s hunt for the rebels, or the scene of Vidal shaving. Visual effects and special effects are deployed well in Labyrinth. Special praise should go to Doug Jones for his work as the faun and the creepy thing that eats kids – it can’t have been easy to prance around all day in either costume, especially the faun’s. Imagine trying to walk around in what are basically small stilts with a load of latex on you and a pair of horns that weigh 4kg. That’s just walking. Try talking as well and actually doing some acting in that getup. Director Guillermo del Toro mixes fantasy with a liberal dose of horror here, and apparently the “horror” part is his signature. From a purely aesthetic point of view, the creature design is good – it moves away from standard fantasy fare and takes a more gritty and surreal approach that works very well for the story. Such an aesthetic is not my cup of tea, but it certainly fits the mood of the movie. I do feel that the violence was too much – the bottle scene was appalling, and there were perhaps just too many scenes of people being shot at close range. It ended up feeling like mere gratuitous violence. If it was necessary to actually show how hard and violent Captain Vidal was, then the bottle scene and the cold way he treated his wife were quite enough. There was no need to show him shooting people point-blank and so on. It is easy to see why critics rated this film so highly. It has exactly the sort of stuff they love – the bleak, dark feel, the “realism” (of the violence), the mix of the fantastical and the horrific, the way it goes against the stereotypes of the fantasy genre and skips into the surreal, and it just has some really good performances by the cast and sufficiently impressive effects work. But a little more of the fantasy and less of the brutality would probably have made this a better film.